Composed, produced, & directed by Kenneth Normal Johnson. Brought to you by Kappa Arts. Presented by the Pender Harbour Living Heritage Society, and sponsored kind by Zoom, Slocat Harbour Tours, Rona Sunshine Coast, IGA Marketplace, Blue Waters Books, Harbour Insurance, and Oak Tree Market. Tickets are $25 and available at Blue Waters Books, Harbour Insurance, Sechelt Visitor's Centre, and from cast members. Seating is limited. Purchase your tickets well in advance or reserve now and pay at the door. Call 604 883-0584 or email knjmusic@yahoo.ca. The Quest, a full-length musical by composer/lyricist, producer/director and performer Kenneth Norman Johnson, received emotional standing ovations from audiences at its June 5 and 6 world premiere performances in the Pender Harbour School of Music. 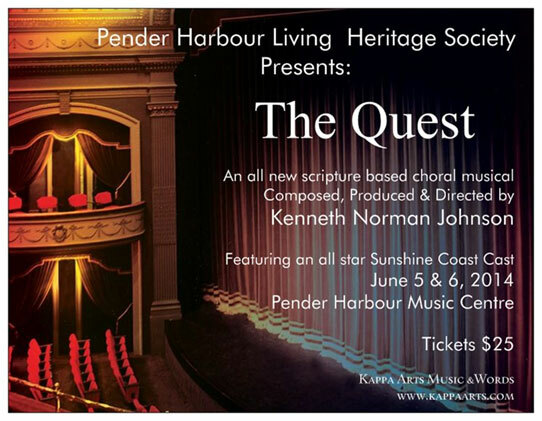 The Quest, a full-length musical by composer/lyricist, producer/director and performer Kenneth Norman Johnson, received emotional standing ovations from audiences at its June 5 and 6 world premiere performances in the Pender Harbour School of Music. Fourteen exceptional singers from the Sunshine Coast practised for months to learn the complex and vocally challenging score, which explores the moral and ethical choices presented by the modern world. Imaginative staging transformed the Music School into a small off-Broadway theatre, and the acting was superb. Johnson hopes to take his talented cast and crew to other venues in the coming months. Revenue from this first production of The Quest was donated to the Pender Harbour Living Heritage Society for use in projects such as the placement of heritage signage around the Harbour, restoration of Sarah Wray Hall (a one-room heritage schoolhouse in Garden Bay) and the annual April Tools festival, which nurtures interest in traditional wooden boat building.